There's always considerable criticism of the "annual review", to the point that some critics have suggested that we scrap the whole enterprise. Yet, companies hold on to the once a year process, presumably because they feel it serves some purpose. The alternate view to abolishing the annual performance appraisal is that, since companies aren't letting go of the idea, that it's better to fix it so it produces positive results. In this section we'll look at how companies (and critics) are moving towards the idea that the once a year evaluation process is flawed enough that it needs a complete overhaul. You'll see some case studies of companies that have changed their process, plus alternatives that have been suggested. One note on terminology: When we talk about performance appraisals, we'll be speaking of the common use ot the term -- as a primarily once a year process, which is usually disconnected from communication all year round, and has become a kind of kindergarten score card that is neither specific enough or cooperative enough to impact on employee performance. You'll find that many of the alternatives to the annual review suggests what I've been suggesting for at least a decade: That you have to integrate any performance discussions with helping staff understand what they are supposed to be doing (goal settings and supplying context, and also relying on year round communication. Finally, we know enough about how workplace performance works that we can build performance management systems that work, and that remove a lot of the discomfort from the process. The problem isn't WHAT companies should be doing, but how we can encourage companies to CHANGE their old-fashioned visions about performance reviews as something that is done to employees by management. The end of the annual appraisal: what's next for performance management? 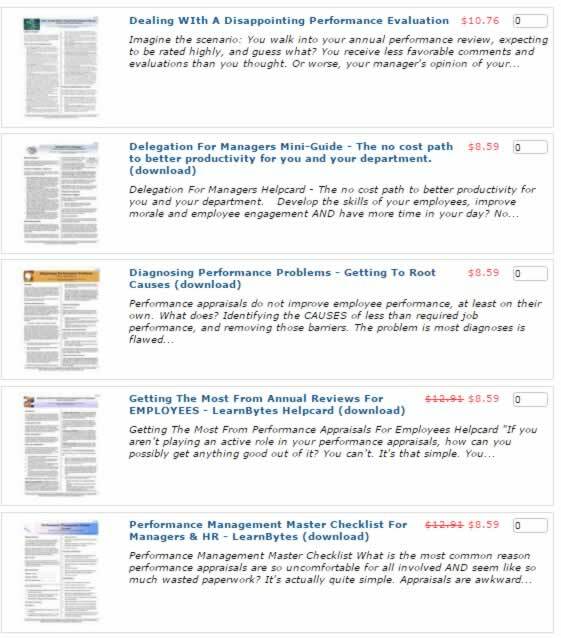 We can help you with the various parts of a performance management system with our miniguides on each component. Instantly downloadable and built to save you time. There's even help for employees on how to navigate the process. Click the image below to view the entire catalog. Copyright © 1998 - 2015 Bacal & Associates. All Rights Reserved. It is illegal to repost or share content from this site on any other electronic platform that is available to the public.